Banjo player Alan Barrows, acoustic guitarist Jerry Palter and standup bassist Mark Shubb are The Folksmen, stars of the movie A Mighty Wind. Barrows (Christopher Guest), Palter (Michael McKean), and Shubb (Harry Shearer) toured as an opening act for Spinal Tap in 2001. Now the folk trio, The Folksmen, are participating in a new mockumentary based upon fictitious folk music icons. The plot of the movie revolves around the son of a folk music icon who has passed away. Jonathan Steinbloom orchestrates a memorial concert for his late father. The overlapping drama of bringing together the musical partners of these performing folk troupes on stage and the artists' interpersonal interaction is the basis of the film action and engaging humor. Back together for the first time, again, A Mighty Wind reunites The New Main Street Singers, The Folksmen, and Mitch & Mickey for "Ode to Irving", a tribute concert in memory of the departed Irving Steinbloom broadcast live from Town Hall in NYC on the PBN channel. Written by Christopher Guest and Eugene Levy and directed by Guest, A Mighty Wind is a humorous spoof on the folk music genre. The film stitches together multiple bits of subtle jokes made by an expansive cast of comic characters rich in personality. Major cast members include: Bob Balaban, Christopher Guest, John Michael Higgins, Eugene Levy, Jane Lynch, Michael McKean, Catherine O'Hara, Parker Posey, Harry Shearer, and Fred Willard. The film weaves together the various folk participants and cast of orbiting characters in an entertaining mockumentary. Most of the film soundtrack selections were composed by Guest, Levy, McKean, and Shearer. 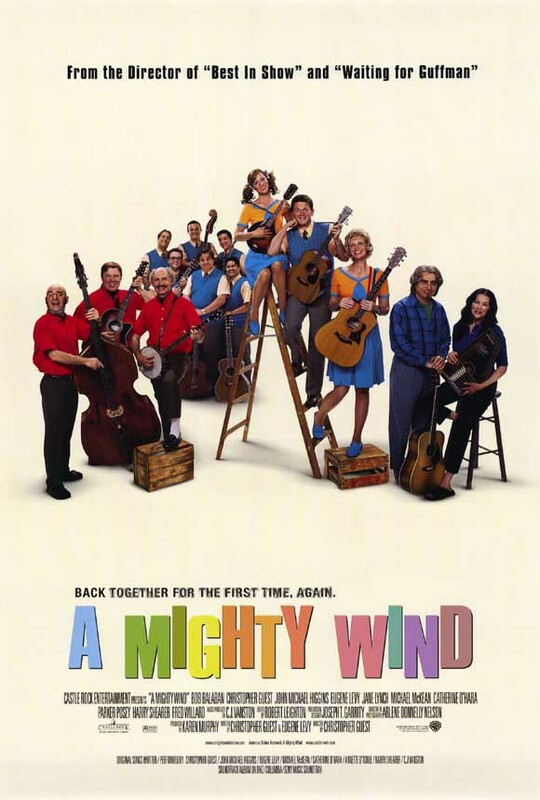 A Mighty Wind - The Album has several first rate performances, which includes a bonus track of The Folksmen covering the Rolling Stones' 1981 single, "Start Me Up".